On May 6, the National Institutes of Health will open national enrollment for the All of Us Research Program, a momentous effort to advance individualized prevention, treatment and care for people of all backgrounds. People age 18 and older, regardless of health status, will be able to enroll. The official launch date will be marked by community events in seven cities across the country as well as an online event. Volunteers will join more than 25,000 participants already enrolled in All of Us as part of a yearlong beta test to prepare for the program’s national launch. The overall aim is to enroll 1 million or more volunteers and oversample communities that have been underrepresented in research to make the program the largest, most diverse resource of its kind. Precision medicine is an emerging approach to disease treatment and prevention that considers differences in people’s lifestyles, environments and biological makeup, including genes. With eyeglasses and hearing aids, we have long had customized solutions to individual needs. More recently, treating certain types of cancer is now possible with therapies targeted to patients’ DNA. Still, there are many unanswered questions leaving individuals, their families, their communities and the health care community without good options. 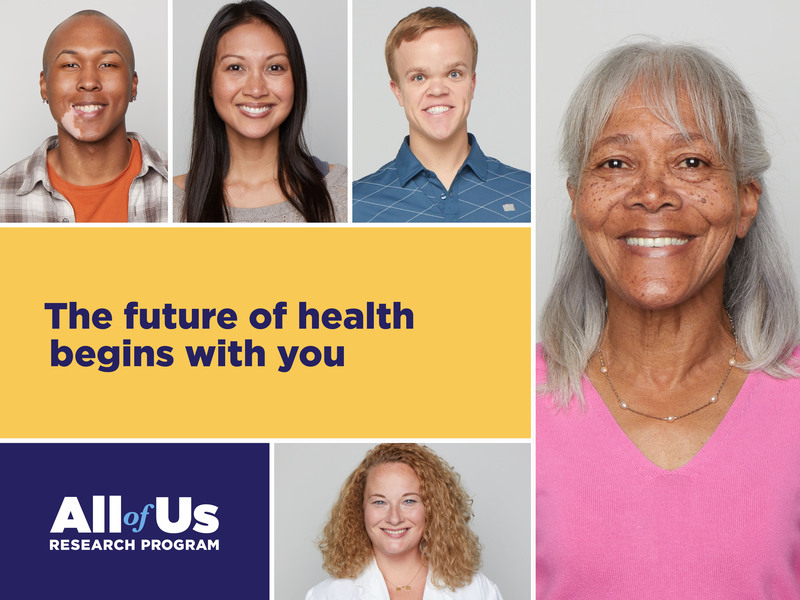 By partnering with 1 million diverse people who share information about themselves over many years, the All of Us Research Program will enable research to more precisely prevent and treat a variety of health conditions. All of Us seeks to transform the relationship between researchers and participants, bringing them together as partners to inform the program’s directions, goals and responsible return of research information. These efforts include building trust among populations historically underrepresented in research. Participants will be able to access their own health information, summary data about the entire participant community and information about studies and findings that come from All of Us. Participants are asked to share different types of health and lifestyle information, including online surveys and data from electronic health records (EHRs), which will continue to be collected over the course of the program. The surveys will cover a range of topics to learn more about participants’ overall health and habits and where they live and work. The EHR data will offer useful information related to medical histories, side effects and treatment effectiveness. At different times over the coming months and years, some participants will be asked to visit a local partner site to provide blood and urine samples and to have basic physical measurements taken, such as height and weight. To ensure that the program gathers information from all types of people, especially those who have been underrepresented in research, not everyone will be asked to give physical measures and samples. In the future, participants may be invited to share data through wearable devices and to join follow-up research studies, including clinical trials. NIH has funded more than 100 organizations from community groups to health centers, academic medical centers and private companies to carry out the program. These organizations have collaborated to develop the program’s protocol and technology systems, to engage diverse communities, to enroll participants and to securely gather and store participants’ information and biological samples for use in research. In future phases of the program, children will be able to enroll and the program will add more data types, such as genetic data. In addition, data from the program will be broadly accessible for research purposes. Ultimately, the All of Us Research Program will be a rich and open data resource for traditional academic researchers as well as citizen scientists—and everyone in between. People also may take part in social media activities (#JoinAllofUs) or tune in at Launch.JoinAllofUs.org to watch speakers across the country talk about precision medicine and the power of volunteering for research. To learn more about the program and how to join, please visit www.JoinAllofUs.org . “All of Us” is a registered service mark of the U.S. Department of Health & Human Services (HHS). See our Media Toolkit section. About the All of Us Research Program: The mission of the All of Us Research Program is to accelerate health research and medical breakthroughs, enabling individualized prevention, treatment, and care for all of us. The program will partner with one million or more people across the United States to build the most diverse biomedical data resource of its kind, to help researchers gain better insights into the biological, environmental, and behavioral factors that influence health. For more information, visit www.JoinAllofUs.org and www.allofus.nih.gov. About the National Institutes of Health (NIH): NIH, the nation's medical research agency, includes 27 Institutes and Centers and is a component of the U.S. Department of Health and Human Services. NIH is the primary federal agency conducting and supporting basic, clinical, and translational medical research and is investigating the causes, treatments, and cures for both common and rare diseases. For more information about NIH and its programs, visit www.nih.gov. What do we hope to learn? What would be expected of me if I enroll in the All of Us Research Program? Will my health information be safe? How do you plan to ensure privacy? What about data security? are service marks of the U.S. Department of Health and Human Services (HHS). The All of Us Research Program was formerly named the Precision Medicine Initiative Cohort Program. Read more about our name change.